There are many types of anniversaries to be acknowledged and celebrated. 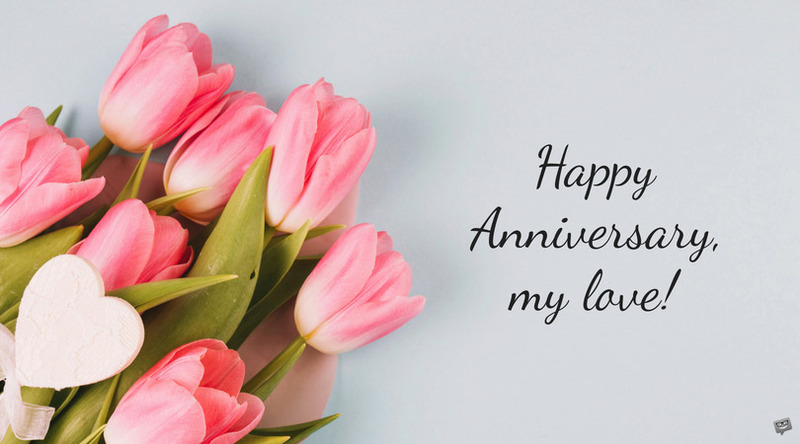 While not all hold the weight of wedding anniversaries, even those such as dating, employment, and achieved-goal anniversaries are worth noting. Knowing you remembered this special day will make it even more exceptional for those who are celebrating. Take some time to review the unique and useful sentiments below and find the perfect one for you to use. Whether you are writing it in a card or sending via text, your thoughtfulness will be appreciated. On this day just one year ago, we vowed our lives to one another. I am so thankful to be taking this journey with you and feel even more committed to you now than before. Happy anniversary, my love! To my beautiful wife, I wish all of the joy and peace this world can bring you because of all you have added to my life in this past year. May this year bring even more blessings upon us. Happy anniversary! To my dear husband, you are my protector and rock in daily living. Thank you for making me feel more loved and secure than ever before. You are a wonderful man! How exciting it is to have lived this past year joined to your side. It is in being with you that I am becoming my best self. I pray to always be as much of a support to you as you have been to me. Happy anniversary! One year down, so many ahead of us! Happy anniversary to the one with whom I want to share the rest of my days! Five years with my best friend and partner in crime, it could not have been better. We have gone from a family of two to having the pitter patter of little feet running around our home. You are making all of my dreams come true. Thank you and happy anniversary! When God brought me to you, I knew He had something special in store for us. I had no idea how special our lives together would be, though. I praise God for you every day. Happy anniversary to my soulmate! 60 months goes by so fast; some said it wouldn’t last! We promised to be joined forever; thank you for joining me in this endeavor! Happy anniversary! This year, let’s just snuggle, watch a movie, and sleep in tomorrow. This has been quite the eventful year and we deserve some relaxation to celebrate our union. Happy anniversary, dear love. Once again, I praise the Lord for His divine intervention in bringing us together. I could ask for no better a partner to share this roller coaster called life. Happy Anniversary. You’re the best gift in my life and I love you unconditionally. Time has passed, the kids have grown, and our love remains strong. You are more special to me every day. May our love continue to shine to those around us for years to come. Happy anniversary! My life is happier, healthier, and more complete because of you. Thank you for bringing me endless joy in our marriage. All of my love to you! Once upon a time, I was searching for love. Now, because of you, I have and continue to live happily ever after. May your days feel as blessed as mine. Happy anniversary! Because of you, I know love and live an enriched life. Because of you, I know happiness and how to share it with others. And, because of you, I know my future will be amazing. Happy anniversary, my love! To my best friend and soulmate, I want you to know I love you more every day and cherish our years together. Happy anniversary, sweetheart! To an amazing couple who shows us all what true love is meant to be. May your days be filled with peace and your nights be filled with joy. Happy anniversary you two! We are blessed to have you two in our lives. You are a shining example of loyalty and connectedness. May each day bring you more opportunities to share this love with those around you. God bless and happy anniversary! Happy anniversary! We were honored to be present at your union and still feel honored having you as friends all these years later. Cheers to many more years of happiness and fulfillment! Seeing you two together year after year reminds me there is good in this world. There is hope and beauty all around us. Thank you for being such examples. Happy anniversary! Happy anniversary to two of the most amazing people in this world! With equal intelligence, talent, and wit, you were destined for greatness together. Here’s to you! Here’s to a celebratory night of laughing, dancing, and pure happiness. You two deserve it more than anyone we know! Happy anniversary! Happy anniversary to the best boyfriend/girlfriend in the entire school. You are too cute for words! Cheers to the one who lights up my world with a genuine smile, heart, and soul. You mean so much to me. Happy anniversary! Thank you for taking such good care of my heart. I do not know how I would have survived this last year without you. You are amazing. Happy anniversary! You are so special to me. You are kind, thoughtful, and generous in everything you do. You are never selfish and always looking out for the betterment of others. You are a blessing in my life. Thank you for being you. Happy anniversary! When I think of you, I am reminded of a dock on the ocean. No matter what wind, waves, or sand storms around, you remain steady. Thank you for being the rock in my life. Happy anniversary to my dearest friend! Congrats on another year with us! Your hard work and dedication does not go unnoticed. Happy work anniversary! You make this office rock! We are so blessed to have you work for this company. Every day, you make an impact to our special clients. Congrats on your employment anniversary! Each day with you here has been such a joy! Here’s to many years ahead! Congrats on another year to the best worker around. We all are so happy to have you here. You have climbed the highest mountains to reach your goals. You are an inspiration to all of us. Congrats on another year of wellness! When you were down and out, you pulled yourself together by the bootstraps and did what needed to be done. You look good on the wagon. Congrats on another year sober! Congrats to the most driven individual we know. Here-here! When goals are achieved, lives are changed. 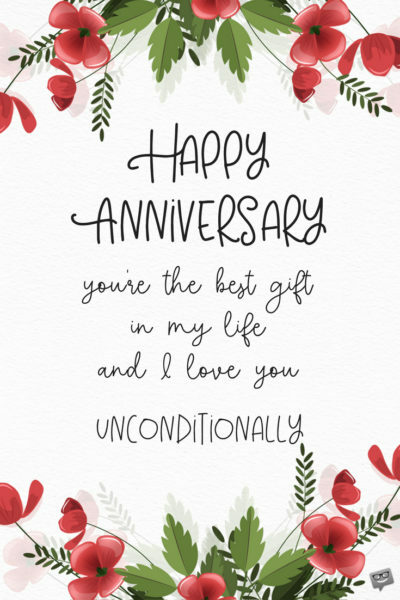 Happy anniversary to you as you remember the day your life changed for the better! Happy anniversary of meeting your goals head on. You are an inspiration to all! As you can see, there are many occasions to send an anniversary greeting. Find one you like or change any of the above to fit your specific situation. These were written to be shared with those who are celebrating. Let them know how much you care by sharing one or more of these sentiments. Happy anniversary to you and yours!